A package arrived at the house of Wisconsin head basketball Greg Gard in Madison last month. Neither Greg or his wife, Michelle, had ordered something. 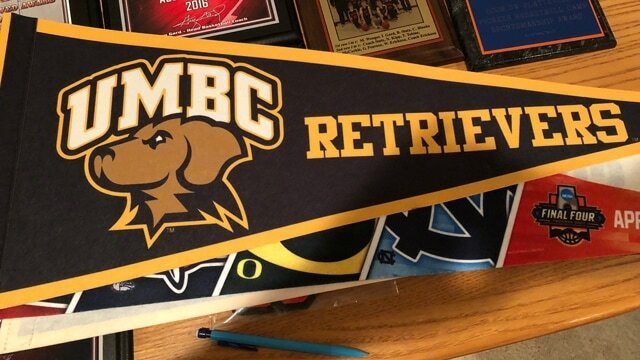 Michelle opened it to find a UMBC pennant. The Gards’ son, 14-year old Isaac, claimed responsibility. He had ordered it online. Isaac Gard had Retriever fever. His dad’s Badgers had gone to back-to-back Sweet 16s the previous two years, but why not jump on the UMBC bandwagon? Gard made sure he told the story to UMBC coach Ryan Odom at the Final Four. The anecdote is one of many to show how much the Retrievers were able to capitalize on their historic first. No. 16 UMBC 74, No. 1 Virginia 54. A 16 over a 1 — and it wasn’t even close. Forget about the seven-point loss to Kansas State in the round of 32. That is just a historical footnote. The victory over the No. 1 overall seed is the one that will never be duplicated. There will never be another first for a 16 over a 1. It happened. And now the chore for UMBC, Odom and the Retrievers program is to make sure this is not their only moment. The creators of the video game Fortnite came to the hotel in Charlotte after the Virginia win so the players could FaceTime with video game star Tyler “Ninja” Blevins. Steph Curry sent the team new Under Armour shoes post-UVA win, which made sense since Odom said the Retrievers test new sneaker products for Under Armour. Odom was suddenly a somebody at the Final Four, making the rounds and getting a spot on the CNN Final Four special as a guest analyst. He was asked to speak to the Navy football staff. He went down to tape a segment in Washington D.C. for a Winter Olympics award show where he was a presenter. He’s throwing out the first pitch at Friday’s Baltimore Orioles-Cleveland Indians game at Camden Yards. He’ll be announcing the Baltimore Ravens’ first-round NFL draft pick at a team celebration at Baltimore’s Inner Harbor next week. “For me personally, my life has changed,’’ said Odom of the slew of requests that continue to come his way. Odom is now no longer just Dave Odom’s son in basketball circles, the former head coach at Wake Forest and South Carolina and one-time assistant to Terry Holland at Virginia. Ryan Odom is now a known commodity. But he didn’t take the bait and jump just because of the historic win over Virginia. There weren’t high-major offers. But Odom could have entertained the idea of moving laterally, or up a level, depending on your perception of the America East. But escaping to a multi-bid league wasn’t a given. So why stay? Well, it wasn’t just because he didn’t have a lucrative offer. “There is a loyalty factory and he senses that when maybe others don’t,’’ said his father Dave, who is retired from coaching, but is the Maui Invitational tournament chairman and a member of the NIT postseason selection committee. The Odom family has now been on both sides of historic Virginia games, with Ryan beating No. 1 Virginia as a 16 and Dave, an assistant coach when Virginia lost to Chaminade in 1982. Ryan Odom isn’t the norm. He’s not chasing anything but more recruits for UMBC. He got a seven-year deal from UMBC president Dr. Freeman Hrabowski and athletic director Tim Hall. Odom is just in year three. Odom said that included money for assistant coaches and upgrades in the facilities. How will that translate on the recruiting trail? But Odom and the administration are keeping things real. They aren’t thinking UMBC is going to be Gonzaga, Wichita State or Butler, as some one-hit wonders have hoped for in the past decade. UMBC still needed a Jairus Lyles game-winning 3-pointer to beat America East top seed Vermont in Burlington to get the automatic bid. The Retrievers did win 25 games, but did lose 83-39 to Albany earlier in the season (going 2 of 20 on 3s doesn’t help). The Retrievers are going to open Marquette’s new home (the Milwaukee Bucks new arena, the Wisconsin Entertainment and Sports Center) on Nov. 6. And they are looking for one more road, one-way (no return) high-profile game. But it’s not like the traditional tournaments around Thanksgiving are lining up for UMBC. The Retrievers were in the Battle 4 Atlantis last season. Well, not really. They were in the mainland version, playing at Arizona and SMU as part of the tournament (they got two home games too against Chicago State and Nicholls), but never stepped foot in the Bahamas. The Retrievers still won’t be the team of record in the America East. Odom was quick to say the league still goes through Vermont. Odom said the staff is still trying to figure out how to brand the historic postseason. That postseason is essentially two games, and one moment. The moment is Lyles’ game-winner over Vermont. The game is the win over Virginia. The other star of the run was/is UMBC’s Zach Seidel, who anchors the athletic department’s social media account. His zingers and sharp keyboard kept everyone on their toes during the month of March. Odom said how they display the historic events of this past season in the new Event Center on campus is still being debated. There was a graphic, Odom said, not a banner, acknowledging the 16 over the 1 up for new student day. But that wasn’t permanent. Ryan Odom almost feels guilty that the win happened over Tony Bennett and the Cavaliers, a coach who he considers a mentor and a program that he grew up around when his dad was an assistant. He said he has texted and spoken with Bennett since the win. Lyles is gone. And so are backcourt mates K.J. Maura and Jourdan Grant. But bigs Jon Sherburne and Arkel Lamar return. Providence transfer guard Ricky Council II will be eligible. He hasn’t played much, since he wasn’t heavily used for the Friars in his first two years (1.0 ppg/0.5 ppg). But the hope is that Council can do for the Retrievers what Lyles did when he transferred from VCU. Lyles jumped from 0.6 points to 23 a game after sitting out. “I think we can have a good team next year,’’ said Odom. “We’ll be strong at the 3-4-5. Next Article Is it time for Chase Elliott and the No. 9 team to worry?